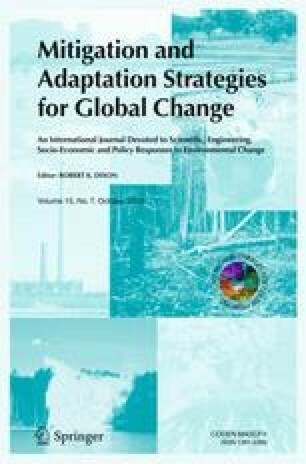 This paper applies the DIVA model to assess the risk of and adaptation to sea-level rise for the European Union in the 21st century under the A2 and B1 scenarios of the Intergovernmental Panel on Climate Change. For each scenario, impacts are estimated without and with adaptation in the form of increasing dike heights and nourishing beaches. Before 2050, the level of impacts is primarily determined by socio-economic development. In 2100 and assuming no adaptation, 780 × 103 people/year are estimated to be affected by coastal flooding under A2 and 200 × 103 people/year under B1. The total monetary damage caused by flooding, salinity intrusion, land erosion and migration is projected to be about US$ 17 × 109 under both scenarios in 2100; damage costs relative to GDP are highest for the Netherlands (0.3% of GDP under A2). Adaptation reduces the number of people flooded by factors of 110 to 288 and total damage costs by factors of 7 to 9. In 2100 adaptation costs are projected to be US$ 3.5 × 109 under A2 and 2.6 × 109 under B1; adaptation costs relative to GDP are highest for Estonia (0.16% under A2) and Ireland (0.05% under A2). These results suggest that adaptation measures to sea-level rise are beneficial and affordable, and will be widely applied throughout the European Union. This study was partly financed by the Environmental Protection Agency Germany (UBA Dessau) and the European Environment Agency (EEA; contract number Z6-002595707). The first version of the DIVA model was developed within the project DINAS-COAST, which was funded by the European Commission’s Directorate-General Research (contract number EVK2-2000-22024). We thank Torsten Grothman, Stéphane Isoard, André Jol, Zbyszek Kundzewicz, Andrus Meiner, Manuel Winograd, Reinhard Mechler and two anonymous reviewers for their helpful comments on earlier versions of this paper and Lars Exner for his technical support in preparing the figures.